Few things compare to the wonderful, intimate artistry of Ariana Hoffman. 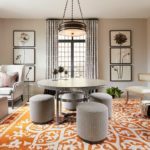 Her company AH & Co. specializes in quality, hand-painted works and surfaces that feel excitingly fresh in today’s world of mass-produced wallpapers and furnishings. A self-taught artist, Ariana, approaches the home like a canvas. At times, her work abounds with elegantly visible brush-strokes reminiscent of Dutch impressionism, while at other junctions, her crisp stencils and clean lines dominate the art. Read on to learn more about her creative process, where she looks for inspiration, and her favorite travel destination. Click through this slideshow to view Ariana’s work space. How did you get into the trade, and what do you love most about your work? Growing up, I was always very artistic and creative, and loved making doll clothes, purses, paintings, etc. After working in the city for awhile, I got an offer from a family friend to come and work for his furniture company that was relocating to New Jersey from Manhattan. My role quickly changed from office management to artistic painter, and it was there that I gained a great deal of experience developing various specialty finishes for the company. After seven years of doing all furniture finishing and working on custom, to-the-trade pieces for designers, architects, and buyers for this national company, I decided to launch my own business. What I love most about my work is the flexibility, the creative opportunities, meeting so many interesting people, and seeing beautiful homes with amazing craftsmanship. To me, inspiration comes in all forms. I collect gems and minerals whose colors often inform my artistic choices. I adore traveling and photography, so a great deal of my references come from what I collect and capture on my trips. I was also raised in a home where both sides of my family dealt in antiques and auctions so I have been surrounded by beautiful things my entire life. 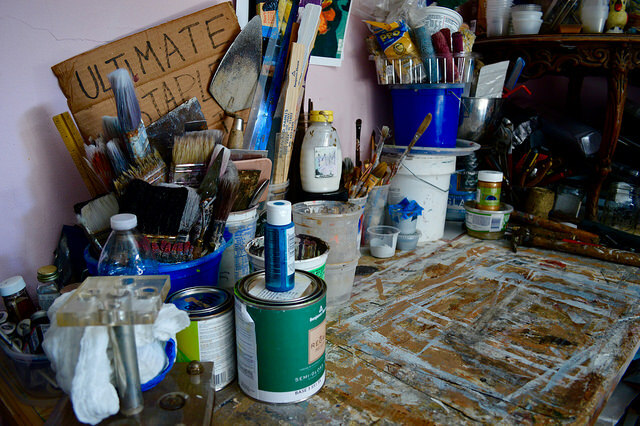 Ariana’s work space is full of an array of supplies. In what ways has your artistic background informed your design choices?Both of my parents had artistic hobbies, and I learned a lot from them at an early age. My father had a woodworking workshop in our basement where he built furniture and repaired things around our home. My mother was a wonderfully talented artist and her passion for painting, stained glass, and silk painting had an enormous influence on me. I appreciate both a traditional/old world and contemporary design aesthetic. A successful space incorporates a bit of all things old and new. What is the client process like, and what type of timeline can clients expect for custom jobs? Depending on the project and scale of commission, the process can take anywhere from a week to several months. An initial consultation is set and it is here that we discuss a client’s ideas and approximate budget. Based on their answers, I offer creative options on color, texture, and sheen to fit their expectations. A second appointment for custom sample review comes next, and ideally, a final choice is decided upon and booking is complete. A lot of my job is educating new clients on what it takes to transform a piece of furniture, ceiling, or wall. 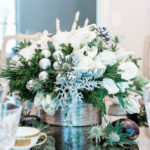 This helps them understand the detail and artistry that goes into creating something unique and special for their home. 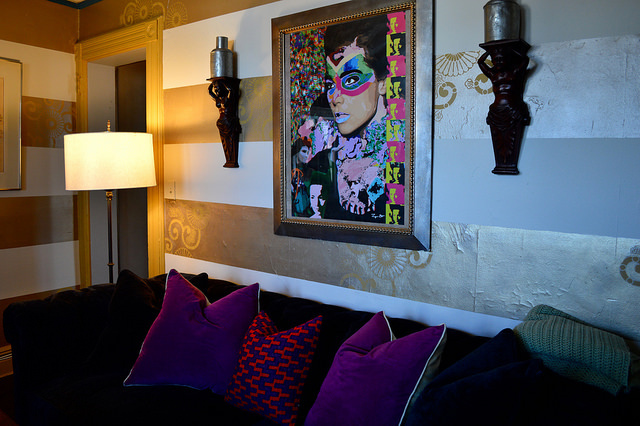 Hoffman’s hand-painted living room wall is eye-catching and unique. What type of finishes would you recommend for a summer beach house? 1. Distressed, painted floors. These are highly durable, washable, and easygoing, with standard wear and tear an added bonus. 2. Organic stencil patterns. Done on a single wall or as an all-over finish, this is a great and unique way to add texture and color. 3. High-gloss, white-pearl iridescent paint. I would use this for a mirror frame, cabinet drawers or even on a powder room wall. 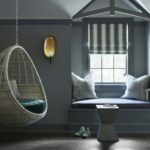 It picks up the seashell vibe in a totally glamorous, high-end way. It also makes for a great light reflector, is highly durable, washable, and goes with anything and everything. What type of furniture pairs well with your metallic room finishes? Metallic finishes truly go with every style. 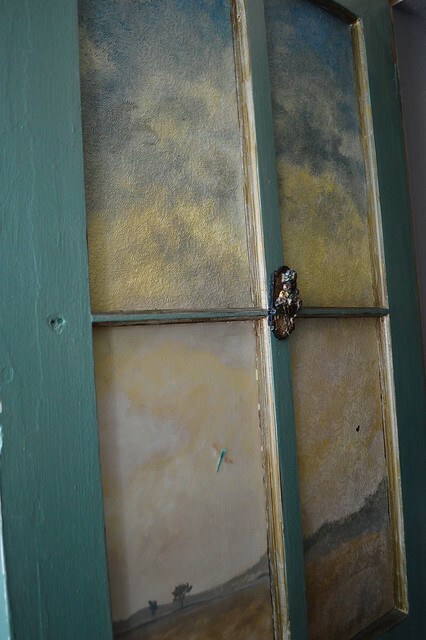 Distressed plaster, concrete, high-gloss lacquer, driftwood, glass..you name it. Metallic paint is effortless to maintain, easily scrubbable, and dries harder than your standard eggshell or flat-finish house paints. 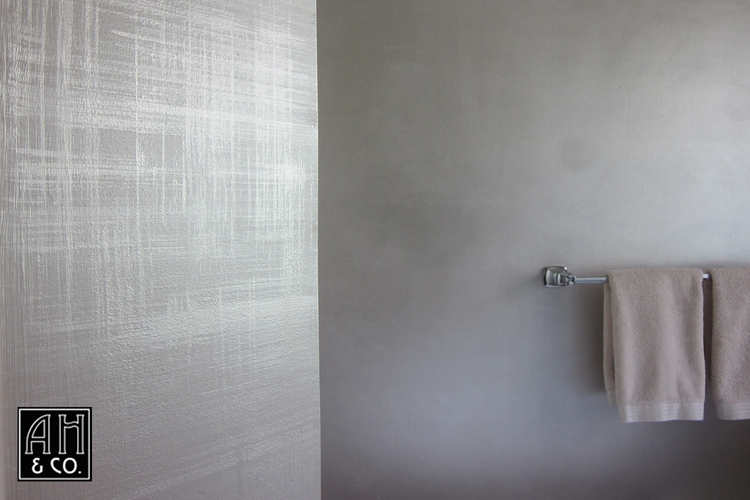 Metallic paint, like the one featured above in a client’s bathroom, is one of Hoffman’s favorites. I love painting floors in a house. Design wise, anything that makes a bold statement is a favorite. Stenciling is also something I adore because a simple design can be layered with multiple treatments and become something so unique that no one can reproduce its artistry. You never want the finish to stand out too much, but rather, be a beautiful, rich and luxurious compliment to the entire space. I like that distressed furniture is coming back as it gives people a break from all of the high-gloss stuff out there. It’s much easier to live with over time, and I love age, patina, and texture on furniture. Give me something with some history…that’s what I like. 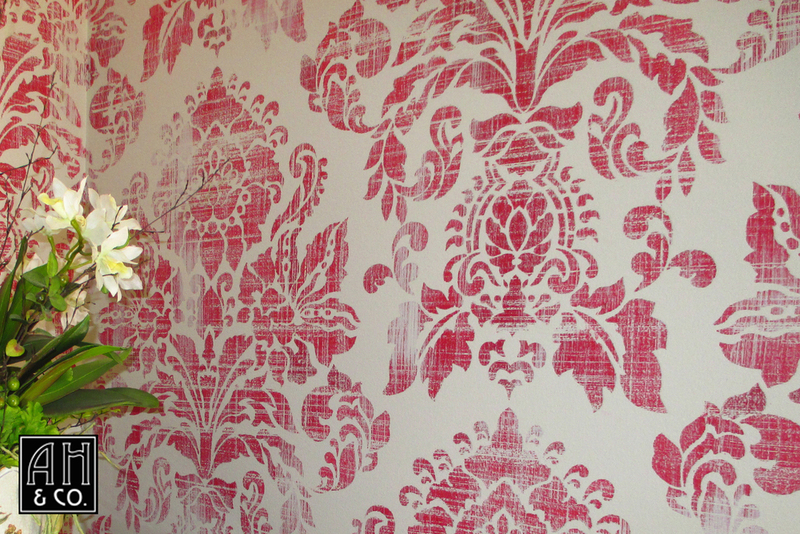 Stenciling makes an instant statement, as seen on the above wall from Hoffman’s portfolio. I would love to produce limited-edition pieces that are sought after because of their American, handmade roots. The influx of mass-produced merchandise coming in from overseas is of poor quality. This lack of craftsmanship in decor and home furnishings is taking away opportunities from U.S. artists. Small boutiques and even local Montclair stores are suffering to stay open because of the brick-and-mortar style competition. 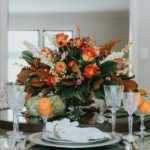 I would really like to get to a point in my career where I am helping talented craftsman become successful and valued for their handcrafted work. Last year I went to Iceland, and the landscape there is unlike anything I had ever seen. This past April I came back from a two-week trip to Italy where I got to learn about different fabric dying and old-world plaster techniques. I fell in love with Matera and Gaeta, my most recent favorite locales for inspiration.